What happens when I flick the light switch? Your home's electrical system is made up of wires and circuits that deliver electricity from the main electrical panel to your outlets. 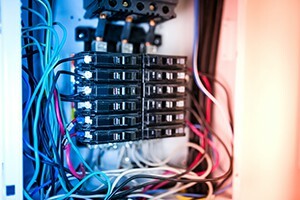 The electric circuits in a standard house electrical wiring system in Canada is generally comprised of 120-volts or 240-volts. Electrical codes lay out guidelines that help facilitate the safe installation of electrical wiring and equipment. Home electrical wiring in Canada is governed by the Canadian Electrical Code. The current code dictates that three-pronged, polarized receptacles are to be used in all new home construction, in addition to outlining the use of ground fault interrupters (GFI) in locations where an electrical appliance may be subjected to moisture. The standard household electrical outlet consists of two three-pronged, polarized receptacles. Each receptacle has a 120-volt 'hot' wire, a neutral wire and a ground. This dual design allows the use of either hot wire to supply the standard 120-volt household circuits. For higher power applications like clothes dryers, electric ranges and air conditioners, a single receptacle is used where two of the prongs are connected to a hot wire and the third a neutral, which can be used to produce a 240-volt circuit. The two receptacles in a common outlet receive power from the same circuit leading from the main electrical supply panel. They are wired together so that two appliances which are plugged into the receptacle receive the same voltage but can draw different amounts of electric current. This parallel wiring is the standard for 120-volt circuits in the entire house, making possible the independent use of all appliances, supplied by the same voltage. The wider prong on the polarized plug will permit it to be plugged in only with the correct polarity. The narrower prong is the 'hot' lead and the switch to the appliance is placed in that lead, guaranteeing that no voltage will reach the appliance when it is switched off. Interruptions in circuit wiring are not only an inconvenience but also present fire hazards. Before buying, selling or remodeling a home, have a thorough electrical inspection completed by a qualified Direct Energy Home Services' electrician. Our trained electricians can provide whole house re-wiring and evaluation of your circuits to ensure the safe delivery of electrical current within your home.